Browsing articles in "Sleep Hygiene"
Eyes open, arms stretched out as you gently slide out of bed ready to face the day after a night of peaceful slumber. A well rested you, is an optimal you because a good night sleep is a form of self-care. 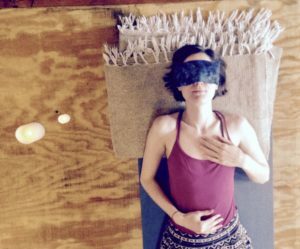 Jennifer, a Yoga District teacher, shares how she went from a restless sleeper to someone who wakes up well rested without an alarm clock. Read on to find out how Sleep Hygiene changed her life and how it could benefit you too. Feel free to attend her upcoming workshop! Welcome to our our Sleep Hygiene series! Sleeping well is a form of self-care. Awaken your mind and energize your body for the day ahead with a good night’s rest followed by an early morning yoga routine. In the first post of the series, Sarah Johnson of Tuck Sleep shares insights about sleep hygiene and the correlational benefits of yoga.